Rome and the Barbarians rounds out my recent study of Late Roman history and the empire’s relationships with the peoples on its frontiers. Unlike the earlier volumes (Goffart, Heather, O’Connell, Bedoyere & Whittaker), Burn’s work looks at the entire history from Julius Caesar’s day to the collapse of the Western Empire c. AD 500. I’ve been unable to find the time to write the review this book deserves so you’ll have to trust without evidence that this history is worth your time. 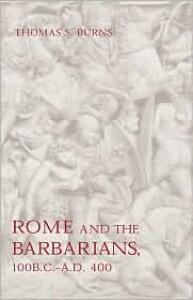 If I did have to sum it up in a short, dust-jacket-worthy blurb, it would be this: Burns shows that in the course of five centuries, the Roman Empire didn’t collapse so much as evolve into a new civilization along the zone where imperium met barbaricum.